Patanjali Recruitment 2018: Latest Jobs Opportunity!!! Apply now for Patanjali Recruitment. Applications are invited from eligible candidates for filling up 7500+ vacancies of Salesman & Other Posts. Those, who are ensuring the eligibility norms required for Patanjali Salesman Recruitment, can register themselves for the suitable posts. The last date for registration of Patanjali Recruitment 2018 is 22-06-2018. Name of Posts: Salesman in various divisions of Patanjali including food. Candidates, who want to apply for Patanjali 7500+ Vacancies, they must 12th Passed, BA, MA, MBA. Preference will be given to those, who possess one or two years’ experience in the FMCG sector. 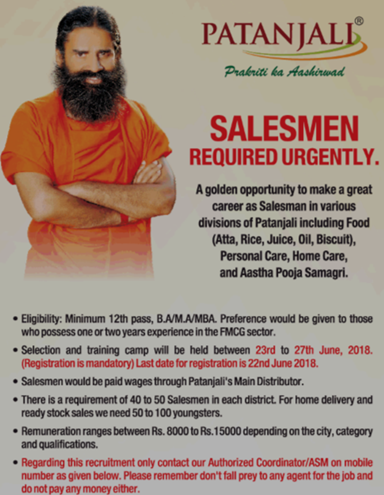 To apply for Patanjali Salesman Vacancies, candidates age should not be less than 18 years and maximum age limits will be considered as per the norms of organization. Relaxation will be given to candidates with reserve category as per the norms. Those, who will be selected for appointment on Patanjali Vacancies, will get remuneration ranges between Rs. 8000/- to Rs. 15000/- depending on the city, category and qualifications. Selection of candidates for Vacancies in Patanjali, will made on the basis of their performances in Personal Interview, which is going to be conducted by the selection panel as on the specified dates. How to apply for Patanjali Recruitment 2018? Now you have to hit on an appropriate link related to Jobs in Patanjali. By hitting the suitable link you will get a PDF file having all the details about Patanjali Jobs. Afterwards you have to contact to the respective numbers available in PDF file for registration. Tell all the information to them for registration. After registration you have to go for the training, which is going to be held on below mentioned dates. For more details regarding Patanjali Recruitment 2018, you should go through the Official Link. You may subscribe our free mail service to get latest updates directly to your mail box. If you have any query related to the content available on this page, you may ask in comment box; we’’ solve it as soon as possible.